We are back from Spain, which means I am officially back in the blogosphere. We had an incredible time - very fun wedding, very fun friends, very fun country. The week of excessive eating has kept me away from the kitchen for a little bit though, as all I have been craving is plane jane food, such as peanut butter sandwiches. When I realized that I had gone through nearly an entire jar of peanut butter this week, however, I decided it was time to get back in the cooking saddle. One of the best things about Spain is the ham. I'm not kidding. I could eat it morning, noon and night - and in fact I did for a good part of last week. My friend Irene, who is from Barcelona, sometimes sneaks it back in her suitcase for me. I am pretty sure that is illegal, so hopefully this post doesn't lead to an arrest. Not that I needed any encouragement, but I am back on a ham kick and I want to eat it at every meal. We decided to have Sunday Brunch at home this weekend, to keep things simple. What started out as simple quickly turned into scrambled eggs, grilled ham, french toast, and banana applesauce muffins (recipes to follow). I couldn't help myself. Everyone likes their scrambled eggs different - fluffy, dry, wet, etc. We like ours not overly fluffy, and done but not dry. I find I achieve the texture I like by only lightly beating the eggs. This may go against everything you've been taught regarding the scrambling of eggs, but I find that over-beating eggs results in a massive loss of flavor. So, I recommend barely beating them, just enough to break the yolks. But, to each their own. This recipe is obviously easy and not very innovative, but delicious nonetheless. 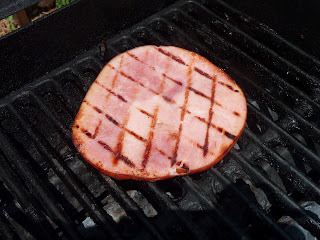 We started by grilling the ham, which is unnecessary but really delicious. Props to my husband for these outstanding grill marks. Melt about 1 tablespoon of butter in a nonstick skillet over medium heat. Lightly mix the eggs, milk, S&P with a whisk or a fork - just enough to break the egg yolks. Pour the eggs in the pan, using a large spoon or spatula to stir them as they cook. When the eggs are about half done, mix in the ham and cheese. Finish cooking and serve immediately.